If there's one thing I never feel bad about eating, it's poke. Traditionally, poke is made with freshly cut ahi tuna marinated in a sweet soy sauce. Of course, it's often served on a bad of two healthy scoops of white rice and furikake. And that's it! Since the poke scene has exploded worldwide, it has now evolved into more of a Subway-esque style salad with numerous toppings, dressings and bases. Although my love for traditional poke has not left, I have embraced this West Coast version of poke and decided to embark on my own variation of salmon poke. I'm so glad that the poke craze has exploded over Vancouver but, along with everything that is popularized, there are always good and bad ones. I think first and foremost, it starts with the seafood. The seafood must be fresh, not fishy and must be pre-marinated. I am not into the whole fast food, Subway-style places where they mix the sauce with the fish right on the spot. It's just not the same! It takes time for the sauce to really seep into the fish so if a place doesn't offer that, it's an automatic write off. Other than, I'm pretty good with everything else! I love the unlimited topping options. The only downfall to that is that it strays away from being a traditional poke and more towards a salad - but not like it's a bad thing! As long as the toppings available are quality I have no problem with it. 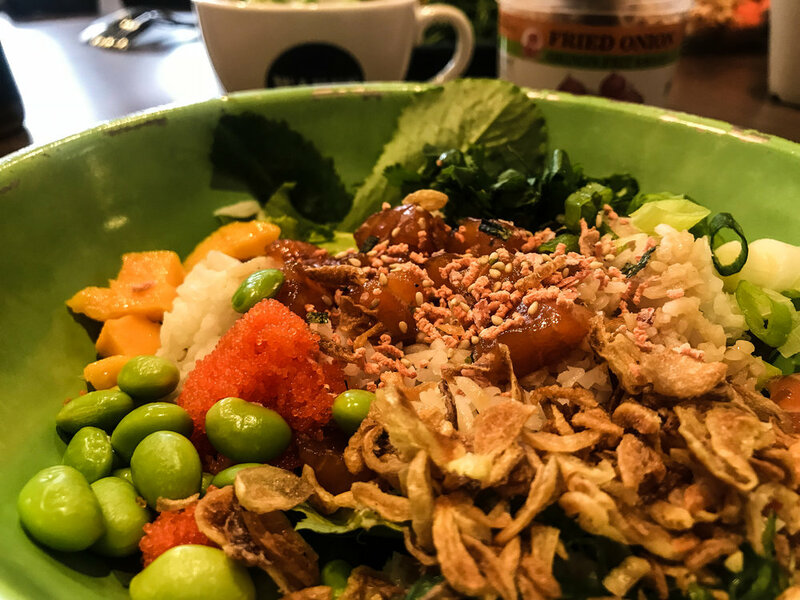 My recipe for salmon poke has nearly all of my favourite toppings on it - edamame, crispy shallots, avocado, tobiko, furikake, wakame, fresh herbs, and more! In all honesty, poke is all about assembling - there are no rules around it! Make it your own and feel free to put whatever it is you'd like in it.... just pre-marinade the fish for god's sake! Cook rice to packaged directions. Let cool and set aside. In the meantime, prepare your poke. Carefully dice the raw salmon into 1/2" cubes. Place in a small shallow mixing bowl and add the rest of the ingredients. Let marinate for atleast 1 hour (4 more hours or longer is best!). Time to assemble your bowls! In four large separate bowls, divide the rice evenly. I usually like to put a handful of spring mix as well. Scoop a serving of poke onto the rice and add whatever toppings you so wish. Get creative!